Juncus acuminatus is a perennial rush 20-80 cm tall, clumped, erect. 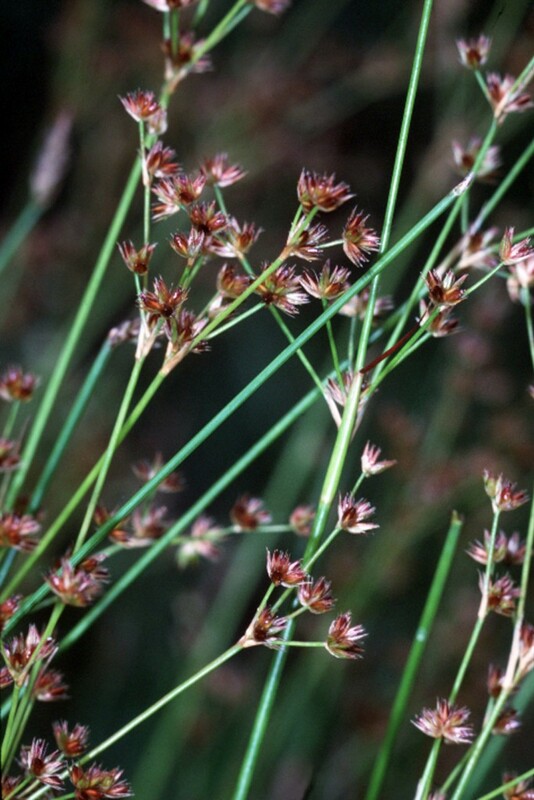 Leaves usually 2, internally partitioned along length (septate; run leaf between fingers feel for regularly spaced bumps), grass-like 0.1-0.3 cm thick. Flower heads 5-20, fairly dense, 10-50 flowered, 0.6-1 cm wide, rounded on top with flattened or conical base; scales small, membranous, among flowers, petals (tepals) 0.3-0.4 cm, about as long as fruit, stamens 3; inflorescence open, unevenly branched, longer than wide, to 12 cm long, about half as wide; June-July. Fruit 0.3-0.4 cm, 3-sided without internal partitions, seeds less than half a millimeter long (0.3-0.4 mm) without appendages; blooming and fruiting June-Sept.
Habitat: Wet meadows, pond edges, swamps, soil pH 4.4-7.2 tolerant of fire, moderately tolerant of shade , intolerant of salt, drought (USDA, NRCS 2010). Notes: Appearing similar to J. canadensis but seeds much shorter. Similar to J. tenuis but bract much shorter than inflorescence and capsules 3-sided.